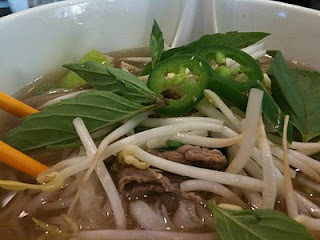 In the fall of 2009, I predicted pho would be the next big thing in comfort food. At that point, I had yet to try it, but its cult following by eaters coast-to-coast indicated that it was at a tipping point. Even with ramen hot on its heels, I'm confident that pho will enjoy its time in the spotlight in 2010, and I'm happy to say that before this happens and I switch my beverage du jour from pho broth to hater-ade on principle--thereby cutting off my nose to spite my face--I was able to slurp back an Atlantis of noodles resting at the bottom of an oversized bowl of meaty, gingery broth. I imagine that most of you reading this (if anyone is actually reading this) have enjoyed the experience, but for those who haven't, I recommend the following: order the special, don't question the meat involved, give it a healthy squeeze of sriracha and lime, and see how long you can make your good manners last before ultimately burying your face in the bowl and ruining your freshly laundered J.Crew button-down. Buen provecho. I lost my pho-ginity at Pho Cali, which is located on 10th and Arch in Philadelphia's Chinatown. In addition to a host of mix-and-match pho offerings, they also slang banh mi sandwiches and other Vietnamese fare (stuff I've never had, but would love to try). I got a so-so summer roll and the bowl of bliss pictured above for $10 including tip. gastro, glad you made the leap. you're right, pho is on the rize! we even have a pho-riday tradition at my work that i will likely observe today. you need to make your life even better and go to pho 75 next time. hooo-aaaaah! I like "Its Pho-ockin time" best. And the pho at Nam Phuong at 11th and Christian the best. That's where I lost my pho-ginity, but I've tried Pho 75, Pho Cali, and the place Pho Hua too. Atlantis of noodles!! And yes, Pho is one of my favorite meals ever and such a price point.